Perfect Small Family Hawaiian Villa!!! Enjoy your stay at this Hawaiian plantation style villa across the lake from the King's Shops and a short walk to the scenic Anaeho'omalu Bay. The villa is located on the 14th hole of the world class Beach Course in the heart of the Waikoloa Resort. Get ready to unlock the door to your luxury vacation retreat. You will open the door to walk across a marble threshold to see a beautifully set glass dining table. Looking further into the living room is an inviting chenille sofa and walls adorned with landscapes by a local Hawaiian artist. As you walk past the koa clock, you will find a modern kitchen with mahogany cabinets and granite counter tops. Don't miss breakfast on the peaceful lanai as you watch the sunrise over Mauna Kea. Our favorite room, the master bedroom suite looks over the well manicured bermuda grass of the second fairway, facing the ancient Kohala Volcano. The room is styled with decor from Tommy Bahama. In the master bathroom, relax in the Jacuzzi soaking tub after a long day in the sun. The guest bedroom, described as 'comfortable and elegant', has a queen-size bed featuring a light down comforter and featherbed with an adjacent spacious bathroom. On location at The Fairway Villas, enjoy your time at the infinity edge pool and elevated waterfall spa, use the fully equipped exercise room, or barbeque at the poolside picnic area. We stumbled upon The Fairway Villas during it's construction in April of 2003 while on our second honeymoon. We had some time on our hands prior to our departure when we stopped at the King's Shops on our way to the airport. We knew that we wanted a place to escape our busy lives in the Bay Area. After returning home, a week of no sleep, and hours of conversation we decided to take the plunge to make Hawaii our second home. Since then, we have visited as often as 5-6 times a year along with sharing our visits with friends and family. We enjoy the proximity to all the amenities of the resort area. We always take a snorkel or sunset cruise with Ocean Sports right out of A-Bay. They are friendly and consistently give great service. Most of all, we love to golf on the local courses and play tennis at the Hilton. 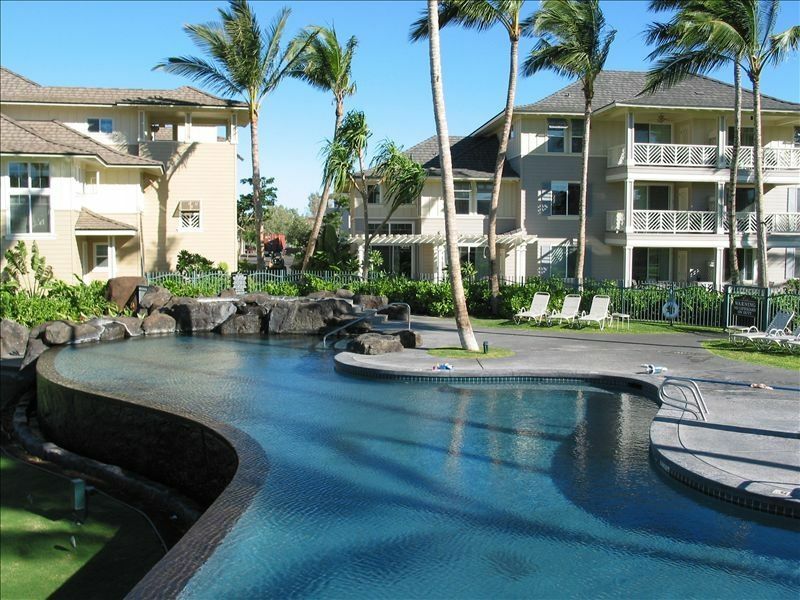 Located in Waikoloa Beach Resort, near Hilton and Marriott Hotels. Feel free to leave a book and take a book. Some gear is provided in the garage bin or you can rent at A-bay from Ocean Sports. We use the facility at Hilton Waikoloa. Lianne gives the best drill classes on the island. She will even inspire the little ones. This condo was everything it was advertised to be. We loved the location. It was within walking distance to the beach, shopping, groceries and restaurants. The condo was very clean and comfortable to spend time in. We really enjoyed the lanai. It was helpful to have kitchen equipment to fix meals. The condo is really nice, clean and very comfortable. It has everything that you would need and it is walking distance to the Queen and King shops, restaurants and the beach. The BBQ grill and pool is just across the condo so, it is well located. We took a Mauna Kea Summit tour and the tour shuttle picked us up across the street at the Queen shops which was also very convenient. The owners are very nice and they provided a list of recommended restaurants, things to do and detailed instructions for our stay. We look forward to coming back! This is a nice 2 bedroom, 2 bath rental. It was very clean and the kitchen has everything you need to cook and serve meals, which we did a lot of. The condo building is maybe a hundred yards from the pool. The pool is nice and very clean too, there's a hot tub next to it, plus a grilling area with 6 Weber grills next to it as well. If we had questions, the owners were available via email. We communicated with them several times during our 2 weeks there, they always got right back to us. The lanai overlooked one of the golf courses and we enjoyed watching the activities that went on, whether it was course maintenance, wildlife, stargazing or golfers. Overall, we had a great time while in Hawaii and the condo was a nice place to come back to as the day wound down. The condo was perfect for us. It was well equipped and in a great location. It was very quiet and the grounds were well kept. The pool was never too crowded and a lounge was always available. The Waikoloa Beach area has so much to offer....shopping, restaurants, entertainment and a great beach. We have been coming to this area for 6 years and will consider the Fairway Village condos for our next stay again.